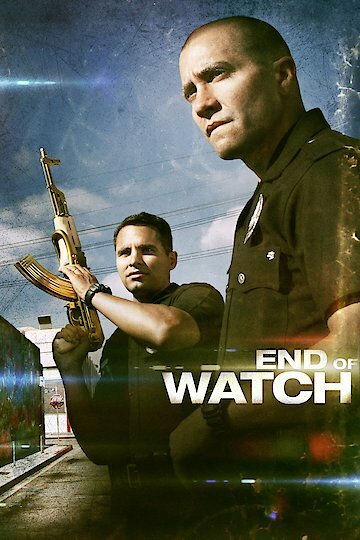 "Every moment of your life they stand watch"
Bringing intrigue and interest to the big screen, End of Watch slams viewers with the action filled lives of two regular run-of-the-mill police officers. End of Watch was directed by David Ayer, and it was later distributed by the production company, Open Road Films. This film’s plot and the clever dialogue were written by a talented writer, who also director the film, David Ayer. In addition, the film was produced by the following: John Lesher, David Ayer, Jake Gyllenhaal, Nigel Sinclair and Matt Jackson. And finally, this film stars many well-known actor and actresses which include the following: Michael Pena, American Ferrera, Cody Horn, Jake Gyllenhaal, Yahira Garcia, Kristy Wu, David Harbour, Frank Grillo, Anna Kendrick, Natalie Martinez, David Harbour and Jamie FitzSimons. The film brings 109 minutes of laughs and thrills because the genre of the film is action, suspense, drama and a little bit of humor mixed in. It is filmed in documentary style, sort of like cops, and the film captures many of the cop humor and drama that viewers crave. The plot of the film is centered on two best friends, Brian Taylor and Mike Cavala, who happen to be work partners. These two friends work together in their local police department, the Los Angles Police Department. Brian, a sarcastic and creative guy, decides to start an experiment and, as a result, he puts tiny cameras everywhere: in his partner and his police cruiser, both their uniforms and in addition, he carries a handheld video camera. His supervisors and colleagues don’t like the idea of the small cameras, but Brian Proceeds anyways. These cameras capture everything: the friend’s personal conversations about their personal lives, plenty of cop drama and even the famous donut runs that cops are famous for. Things get even more complicated when this dynamic duo encounters a trouble making drug cartel. They try and stop them and, as a result, they created a huge enemy. After many threats and encounters, Brian and Mike decide to put a stop to the drug cartel, and take them where they deserve to be; in a cozy cell in jail. Brian played by Jake Gyllenhaal: Brian is a police officer who works at the LAPD, and his partner is Mike. He is the one who is responsible for setting up the video cameras everywhere. Mike Cavala: He is Brian’s partner, and he adds a lot of drama to the film. End of Watch is currently available to watch and stream, buy on demand at Amazon, Vudu, Google Play, FandangoNow, iTunes, YouTube VOD online. The numbers were so close that a victor couldn't be named until Monday, but finally it happened. It was a good weekend for "End of Watch," but you can't say the same for "Dredd."